Big Walnut started Boys Cross Country in 1967 and Girls Cross Country in 1978. The home course was located on the school grounds. The 2-mile course started and finished on the football field, Both girls and boys ran the same course, The distance was changed to 2.5 miles in 1977. From 1982 to the present, the race distance is 5000 meters (approximately 3.1 miles). The State began Boys Cross Country with one Class for schools from 1928 to 1965. In 1966 the State divided into two classes (Class A and AA) until 1969. From 1970 to 1988 the State divided schools into 3 Classes (Class A, AA, and AAA). In 1989 the State changed from Classes to Divisions and formed 3 Divisions (Division I, II and III) which are still in use today. The State began Girls Cross Country with 2 Classes (Class AAA and A-AA) which it used from 1978 to 1981. From 1982 to 1988, the State added a third Class (AAA, AA, and A). In 1989 the State changed from Classes to Divisions (Division I and II) from 1989 to 1993. From 1994 until the present, the State has used three Divisions (Division I, II, and III) for Girls Cross Country. The first girl to officially run Cross Country on the BW Boys team was Margaret Sherrets in 1974. The distance was 2 miles. In 1977 before Girls Cross Country officially started in 1978, two more girls wanted to run with the boys’ team, Kelly Roach and Carrie Highland. The Central district Cross Country Coaches Association sponsored a race at the boys Sectional Meet on Pine Hills Golf Course in Carroll, Ohio, Carrie Highland ran in the race placing 494. Shannon Cline of Upper Arlington won the race. Kelly Roach was unable to run because she was in an automobile accident the night before. Step back a few years to 1969, a group of 15 girls approached Coach Red Edwards and asked if they could run Cross Country. Red got it cleared through the school. They began training along with the boys. Seven girls ran in the Worthington Cross Country Invitational at seasons end. 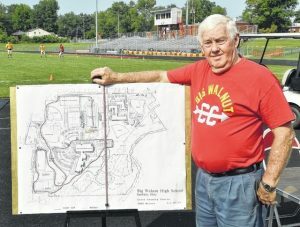 Over the years, Big Walnut has hosted many dual and tri-meets, Mid-Ohio Championship in 1972, Central Buckeye League in 1981 and 1985, the Delaware County meets in 1995, 1999, 2003, and 2008. BW also hosted the Ohio Capital Conference Championships in 2001 and 2003. Big Walnut started Middle School Cross Country in 1985. They ran their home meets at BWHS before moving to Cheshire Road in 2010. Norm Nelson, Big Walnut Athletic Director and Coach of many sports, spoke at a sports banquet calling Cross Country Runners “the most unappreciated athletes in all sports,” quoted in the Sunbury News 1975. I am so fortunate to have such great historians like Red to put information like this together. This information is invaluable to the History of Big Walnut Athletics.